Are you in need of a book that will make you feel more at ease with the rumblings in your head, how to manage the difficulties of identity transitions that befell you through no fault of your own and to indulge in sublime writing that inspires and speaks in a warm, gentle, engaging tone? 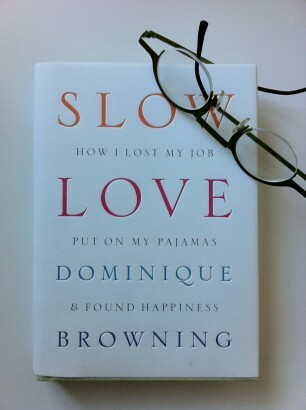 I urge you to consider Dominique Browning’s Slow Love– How I Lost My Job, Put On My Pajamas and Found Happiness, released this year. I had the pleasure of attending one of her readings in coastal Rhode Island, up the road from where she now calls home. I was transfixed with her passages and presence. At the end of the reading, I really wanted to talk to her, but it was one of the rare occasions when I couldn’t think of absolutely anything to say. I flew through the book (should have paced myself and savored it) and immediately picked up one of her earlier works, Around the House and In the Garden. I loved it too. She is about my age, and in an odd way, I feel as though we could be friends. Find her book and read it. It will make you feel calm and strong as well as give you a glimpse into the personal musings of a phenomenal writer and editor. If you don’t have the time or inclination to read her books, start with her blog-one of my all time favorites and regular online reads- Slow Love Life.